Brief – Design and build a portable free standing custom A4 poster displays to show thirty head shot portraits of actors that graduate throughout the year. These need to be displayed in theatre foyers where Lamda are staging the final year productions that are part of courses.Industry figures go to these shows to discover upcoming talent. 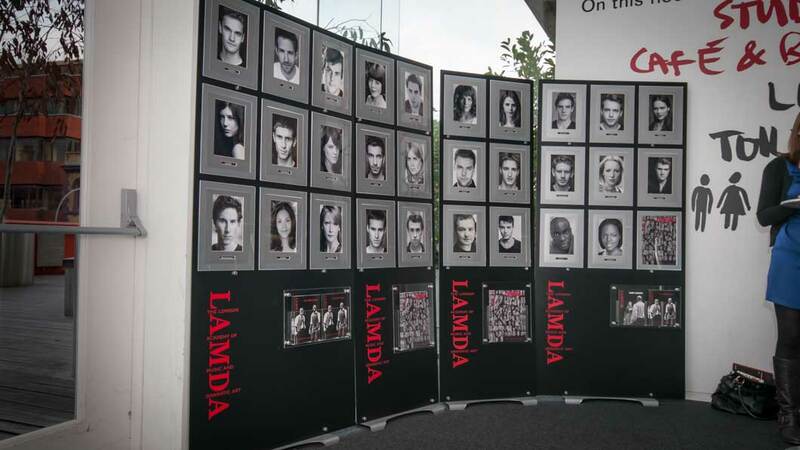 The client being LAMDA, a leading drama school based in Hammersmith in London. Established in 1861, its alumni include David Suchet and Jim Broadbent. The in-house theatre at their Talgarth road campus where they normally stage these productions is unavailable whilst they carry out major rebuilding work. 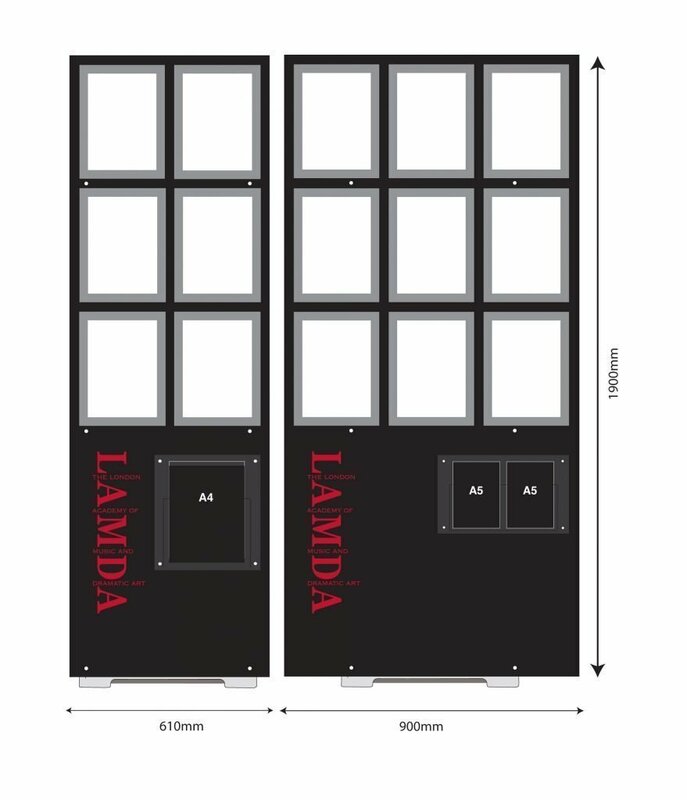 To solve the problem Lamda are using commercial theatres around London to put on their productions, hence the need for a portable display system. Solution – Using four D3 tall display frames we created 4 custom A4 poster displays. Using black 3mm Alupanel we created rigid totems on to the which we fixed magnetic A4 acrylic poster frames. We branded the panels with red vinyl and also attached our standard brochure pockets for dispensing literature. The D3 system is stable enough to support 5 – 8kgs that the panels weighed. Swapping the framed portraits is quick and simple and the systems and acrylics pack down into five travel bags and we had a custom rigid polypropylene case made to protect and transport the custom A4 poster displays. All the displays are transported with the stage sets to each theatre.